Problem: There exists a common necessity for the water of the Everglades to maintain agriculture, municipalities, recreation, fisheries and wildlife. This water resource must be shared among users in a variety of competing groups besides two national parks, Indian reservations, sugar farmers, ranchers and municipalities. Over six million people demand the services of the Everglades that is a watershed providing the water needed for the wildlife and fisheries of the Everglades and Florida Bay. This is also the sources of water for seven to ten million south Floridians. National, state, and local leaders understand the importance of these wetland reserves. The everglades are just one of several examples in Florida of Marjory Stoneman Douglas' idea that this state has always been based on a bet that the payoff would come before the costs came due. Today as the water quality decline in the glades has lead to a loss of 90% of the bird life and important fisheries, the bet is being lost. The costs are coming due and the federal government, home owners, tourists and agricultural interests are fighting over who should pay for restoration and how ought that cost be fairly allocated among these users. Because the price of restoration is higher than the available revenues intergovernmental cooperation is a significant precondition for the effective spending for the biological restoration of the rivers that feed the rich grasslands of the everglades. 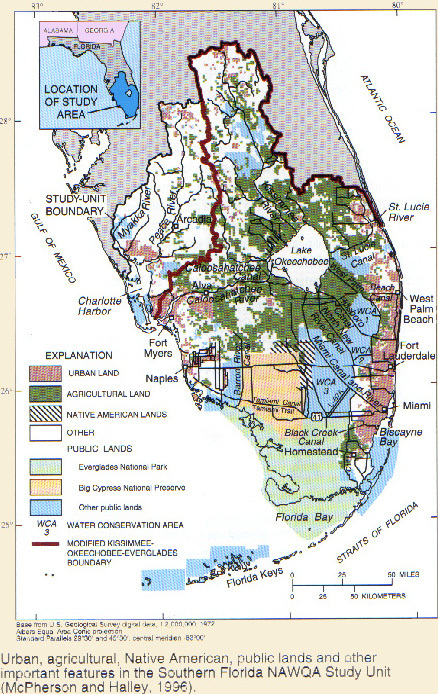 Since the taxing authority for restoration resides with the South Florida Water Management District, a creature of the Florida State legislature and the Governor, irritation arises from the scarcity of monetary resources and the enormous costs of purchasing lands for the restoration of wetlands. The South Florida Ecosystem Restoration Task Force was established through an Interagency Agreement signed on September 23, 1993. The Task Force was established to "coordinate the development of consistent policies, strategies, plans, programs, and priorities for addressing the environmental concerns of the South Florida ecosystem." The Task Force created a Management and Coordination Working Group (The Working Group) to annually formulate and recommend to the Task Force management policies, strategies, plans, programs, and priorities for ecosystem restoration and maintenance. Endangered species are among the many pressing reasons to restore the water flow of the everglades. But the realization that there is insufficient water for wildlife and the social demands that relies on the thin sheet flow of this area. Florida has among the most number of endangered habitats, species and endemic biotic communities of any state. These restoration efforts are a bittersweet effort because the urgency is underscored by the declines of the Florida panther and West Indian Manatee that are among the most precarious endangered species in the nation. Little more than 2400 manatees (marine mammals) remain in the state and fewer than 70 panthers roam the swamps and hammocks of the glades. This area of grasslands, cypress forests, mangrove swamps and tropical hardwood stands are a refuge besieged. Over 700 people per day move to Florida making the state the largest and fastest growing place in the nation. With that the everglades restoration effort becomes a signal for the depth of our efforts to promote biological diversity. The ecosystems of the everglades are the key to protecting these precarious species. The effort to enhance these biotic communities and precarious species falls to the Working Group. They are assisted and better integrated through the work of four sub-groups including science, management, infrastructure, and public information and education, in addition to an ad hoc committee for social sciences. Each year the Working Group produces a report of the interagency activities aimed at achieving the ecosystem management goals of the Task Force. In 1995, the memberships of the Inter-agency task Force Working Group, and Subgroups were integrated between federal and state agencies and local Indian tribes. This was an original priority of the Task Force, made possible by a provision of the Federal Unfunded Mandates Reform Act of 1995. This action improved communication and coordination between the agencies responsible for the restoration and maintenance of the South Florida ecosystem.